High-quality Canadian red fox fur blanket not only convinces with its precious real fur from "Fur Harvesters", but it is also visually a highlight at your home. This real fur blanket brings warmth and charm to every room, whether bedroom, living room or dining room. 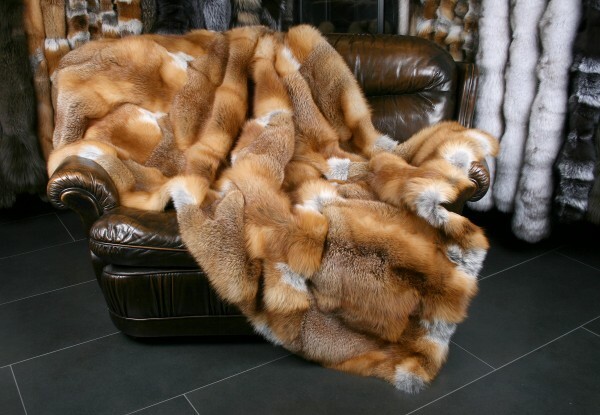 The Canadian red fox fur blanket attracts the attention everywhere and invites you to cuddle up on cold evenings. For every real fur lover, this red fox fur blanket is a must-have and should not be missed at your home. The red foxes were processed in our furrier workshop in Kiel. Lars Paustian guarantees you best quality products; please let us know if you have any questions about this Canadian red fox fur blanket. Related links to "Canadian Red Fox fur blanket natural (Fur Harvesters)"
Customer reviews for "Canadian Red Fox fur blanket natural (Fur Harvesters)"